So I’ve been obsessed with this blazer since the mustardy/yellow one came out a while back. 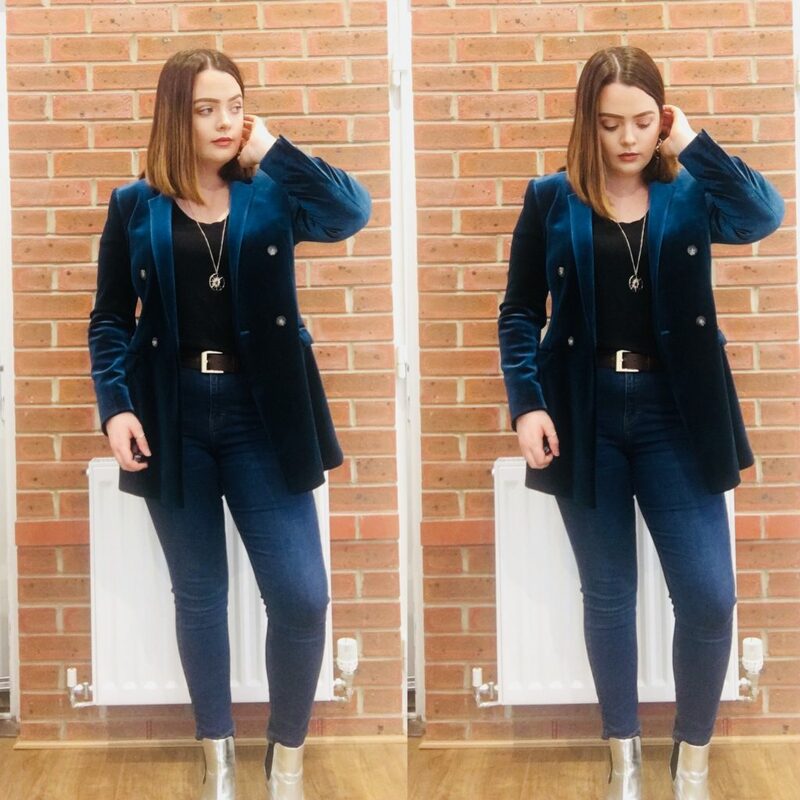 Topshop’s royal blue velvet blazer is a statement to any outfit, whether you’re wearing it day or night, styled up, styled down, it’s the perfect edition to your wardrobe. I’ve styled this look as something I’d wear to go shopping, even out to dinner…this is ideal if you’re wanting to create something smart/casual. I think silver boots are a statement to any outfit this autumn. Adding a chunky belt with some high waisted jeans is a great way to block out this outfit. I added a long necklace to split up my chest area, as I have an hour glass figure and it’s also a great way to break up the colour. Look two is something I would wear to uni, or out for lunch with the girls. This is a really casual look as I’ve paired them with some trainers. My choice is my hi-top converses as they’re super comfy and compliment the striped red tunic I’ve got underneath from ASOS. This jacket FYI is super warm too and has an elasticated type arm where although it’s fitted, it’s really great for anyone who’s in-between sizes or like me wants the fitted shape but the freedom of a slouch style jacket. My final look is for a formal dress. 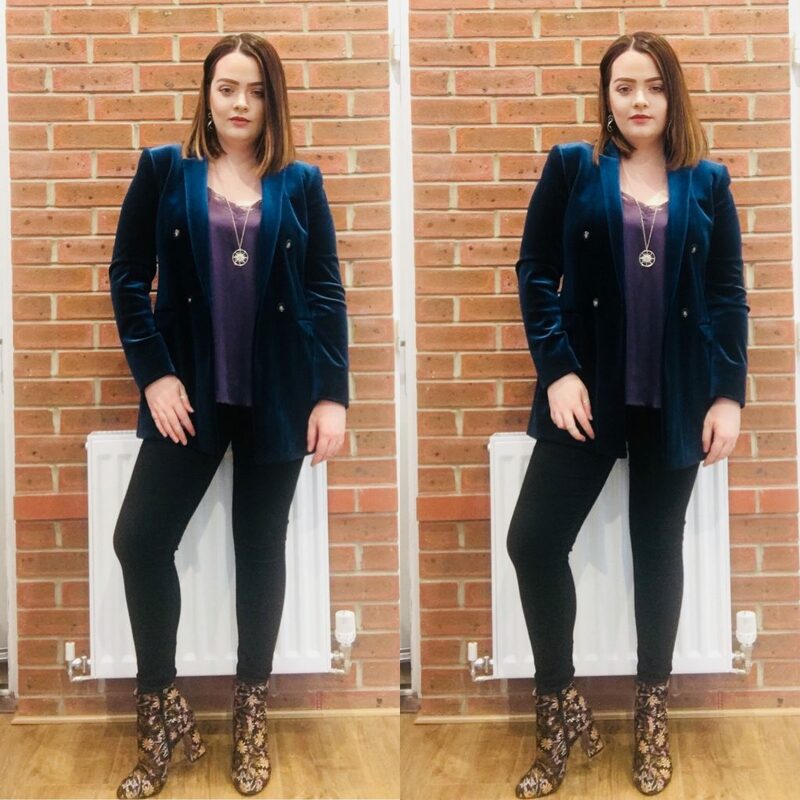 I paired my beautiful blazer with some floral print purple and gold boots from Public Desire. The necklace is the same, a lovely long-line prohibition style pendant with a stone in the middle from Accessorize. I’m hosting a 1920s themed party next month and I think the satin cami is a perfect combination with my Topshop ‘Joni’ jeans. 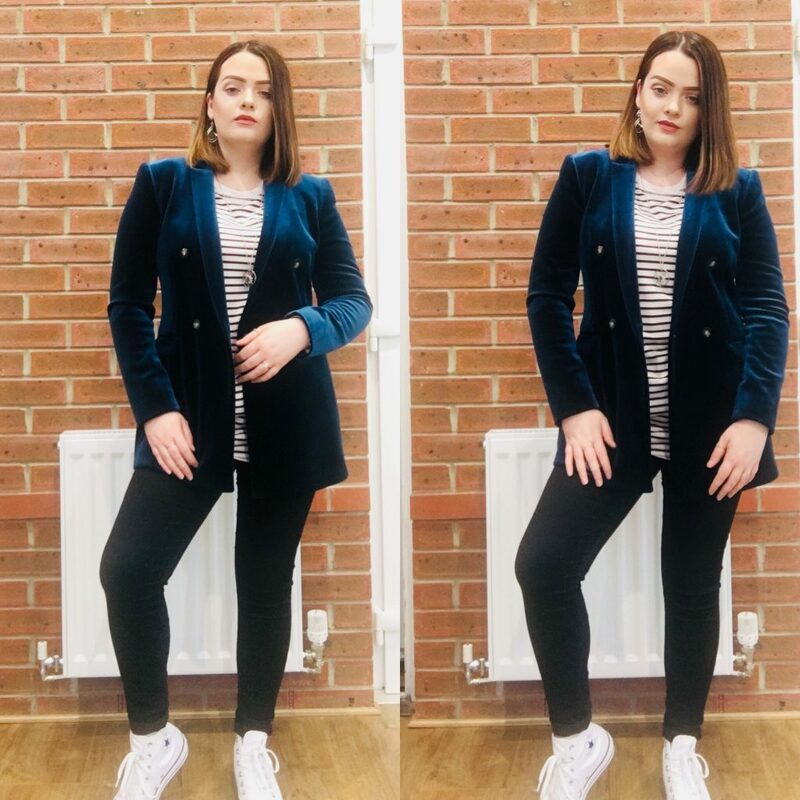 I love this jacket so much as its so versatile and can be worn anytime of the day, style up with some heels or dress it down with some trainers for the perfect outfit of the day.